UPDATE 2012-05-21: see this comment added by Eric Gerds, author of PluginDetect. PluginDetect is legitimate software that is misappropriated by malware authors. PluginDetect != malware. 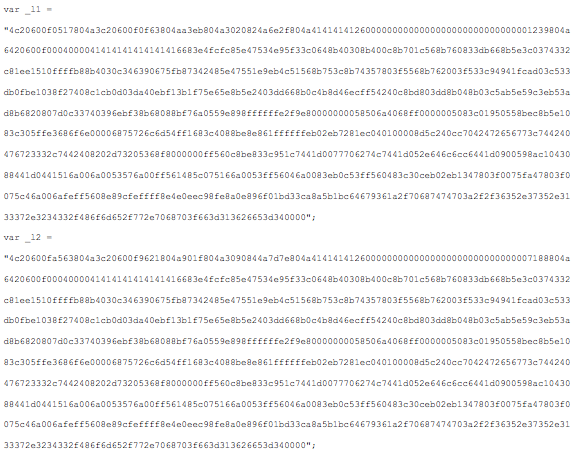 UPDATE 2012-02-19: by request I added the decompiled Java from obe.jar/rin.jar, see inline links. UPDATE 2012-02-16: Cryptome links to prior art from Dec 12th 2011. It has visuals and more elaborate explanations. Good stuff! UPDATE 2012-02-15: I added section “Obfuscation”. 1a) iff Java 6.0.0-28, embed rin.jar <—- contents of rin.jar (not-so-gracefully) decompile to Wiki.java. 1b) iff Java < 6, embed obe.jar <— contents of obe.jar (gracefully) decompile to b.java, f.java, Plugin.java, q.java and v.java. As stated above: the shellcodes in variables bjsg, _l1 and _l2 still need to be analyzed. ‘Obfuscation’ refers to hiding program flow and variables to make it difficult for humans and computers to understand WHAT a program does (e.g. intercept keystrokes, attack others systems, avoid detection) and HOW (e.g. SetWindowsHookEx, nmap + exploit remote vulns in Windows, rootkit techniques), including network connectivity. Here are examples of obfuscation found in the Blackhole malware. Last updated: 2016-02-14. Some old JFQ links are broken due to JFQ having been moved in Q1/2014; I still need to fix the links. Selected NATO CCD-CoE publications are listed at the bottom. Access CCD-CoE’s Publication Library for all available publications. I will keep this post updated. Contact me at mrkoot[at]gmail[dot]com with your suggestions, broken links, et cetera.